These words were penned in 1912 by a former student of Joseph Henry, for sixteen years a favorite teacher at the one of the nation's most prestigious schools, the College of New Jersey (now Princeton University). Henry, a renowned physicist, was tapped to become the Smithsonian's first Secretary in 1846, and served in this role until his death in 1878. He would continue to mentor young scientists as time permitted, but was greatly missed as a professor. 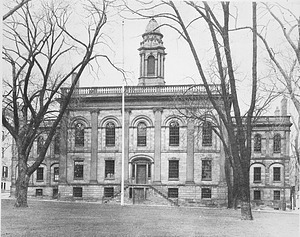 Henry began his career as an educator in 1826 at his alma mater, New York's Albany Academy, as Professor of Mathematics and Natural Philosophy. 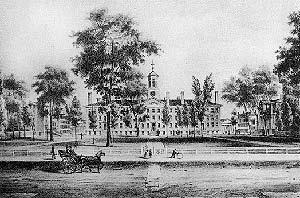 As the only professor at Albany to be honored with a formal inauguration, Henry gave an inaugural address that revealed he had already formed strong opinions on his role as teacher and professional scientist.2 Henry taught at Albany until being appointed Professor of Natural Philosophy at Princeton in 1832. At a time when the primary modes of instruction were lectures and recitations—during which students were required to demonstrate their understanding of the material—Henry's innovative practice of engaging students in scientific experiments made him a popular teacher. Henry often designed these experiments as a component of his own research in electricity and magnetism, so their outcomes were not known in advance.3 A set of lecture notes Henry drafted at Albany illustrates his use of experiments as a teaching tool and his diligence as a teacher. Classroom experiments on electricity and magnetism contributed to some of Henry's major scientific achievements during his years at Albany, including his independent discovery of electromagnetic induction. He described these in letters to colleagues Benjamin Silliman, at Yale, and British scientist and co-discoverer of electromagnetic induction Michael Faraday. 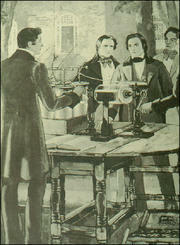 At Princeton, classroom laboratory sessions and record of experiments continued to serve as opportunities for research and reflection by Henry.4 "[Prof. Henry] showed us his huge Magnet & to show its power made it lift a number of us—equivalent to 3500 lbs.," wrote Princeton senior John Buhler in 1846. Henry's notes from the same day confirm that the powerful electromagnet he had developed thirteen years earlier was capable of lifting eight men, with others pressing down on a lever, and that the "magnet exhibits the curious phenomenon of persistence in polarization." 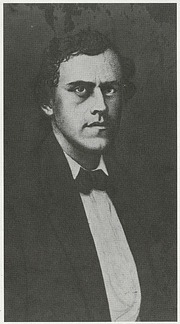 In 1846, former student Francis M. Levison wrote to Henry to thank him for imparting what he saw as the most valuable skill for his chosen profession as a lawyer, the "ability to reduce particular cases under the great general principles of the Law." "That habit of generalization," as Levison put it, was central to what Henry hoped to give his students. In closing remarks delivered to his natural philosophy students that year, Henry had admonished them "to afix principles in your mind by applying them to various ideas until you understand them." Henry also urged students not to use his class as a venue for demonstrating intellectual superiority, advising them to "let [their] desire be to arrive at truth rather than obtain victory." Finally, Henry felt strongly that research experience must be required of science professors, and advocated against hiring based on a candidate's connections or apparent abilities as a lecturer. "[W]hatever may be a persons capacity for communicating knowledge he cannot teach more than he knows," Henry wrote to Benjamin Silliman, Jr., who hoped to become a science professor himself. Henry's engagement of his students in actual scientific research, and the combination of knowledge and enthusiasm he brought to the classroom, are important elements of his legacy as a scientist. "A genius for education,"21 Henry saw the value in good teaching, writing to one Princeton graduate that "if you succeed in awakening a single undeveloped mind to the importance of knowledge you may console yourself with the reflection that you have not lived in vain." Judging from the warm letters Henry received from his former students, and from memorials penned after his death,22 Henry's influence as a teacher was profound and long-lived. List of student notebooks from Joseph Henry's classes, 1835–1849. 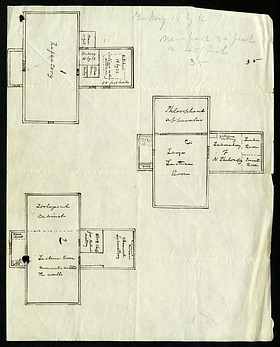 Joseph Henry's lecture notes and student notebooks, Smithsonian Institution Archives, RU 700, Boxes 16-19, 31. Joseph Henry, "The Philosophy of Education (1854)," in A Scientist in American Life: Essays and Lectures of Joseph Henry, eds. Arthur P. Molella, Nathan Reingold, Marc Rothenberg, Joan F. Steiner, and Kathleen Waldenfels (Washington, DC: Smithsonian Institution, 1980), 71-87. 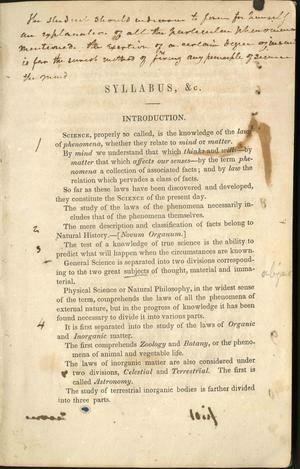 Joseph Henry, "Geology and Revelation (early 1840s)," in A Scientist in American Life, 23-29. The final installment of a short lecture series given by Henry, open both to Princeton students and non-students. Charles Weiner, Joseph Henry's Lectures on Natural Philosophy (Ph.D. dissertation, Case Institute of Technology, 1965). Charles Weiner, "Joseph Henry and the Relations between Teaching and Research," American Journal of Physics 34 (1966). Barbara Myers Swartz, "Joseph Henry--America's Premier Physics Teacher," The Physics Teacher 16 (September 1978): 348-57. Marc Rothenberg, "Joseph Henry: Promoter of Anthropology," Smithsonian Institution Archives. Marc Rothenberg, "Joseph Henry: Educator," Smithsonian Institution Archives. 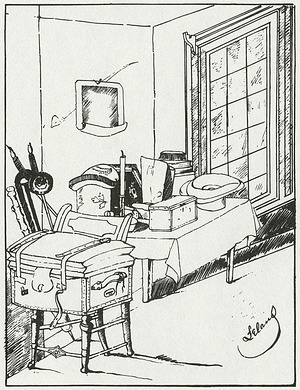 Meredith Farmer, "Henry, Melville, and the Smithsonian," Unbound (blog), Smithsonian Institution Libraries, September 11, 2015, http://blog.library.si.edu/2015/09/henry-melville-and-the-smithsonian/.